Unity Ads generates revenue by displaying paid advertisements in your game. The more traffic and impressions your game creates, the more money you can earn. The average eCPM for Unity Ads depends on many factors, such as platform, region, player demographics, and in-game placements. The biggest factor is the number of players engaging in your game. The Ads monetization Best practices guide provides advice on maximizing revenue through strategic implementation. You can view statistics on your Ads monetization on the Ads Monetization Developer Dashboard. If your revenue displays as $0.00, you may need to be patient. Each time a video is started, it creates an impression. However, it may take around 5000 impressions for our targeting algorithms to determine the quality of users provided and start showing consistent revenue. For more information on using the Developer Dashboard to analyze revenue metrics, see documentation on Monetization statistics. Publishers can now receive automated payouts for their Unity Ads earnings every month. This article provides a step-by-step guide to configuring automated payouts for your Organization. To get started, log in to the Unity ID portal. Note: Unity Ads currently only supports payouts in USD. 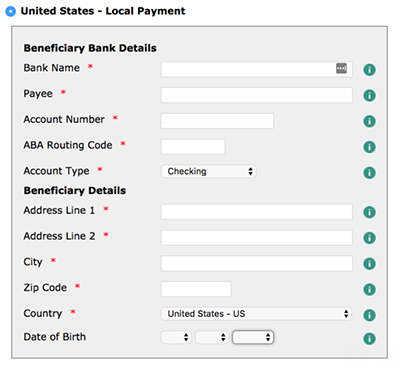 In order to receive payment, you must configure a payout profile. Payout profiles are associated with Organizations. Each Organization has one profile per service, so you can only create one profile for your Unity Ads earnings. Note: You must be the Organization’s Owner to see, create, or update its payout profile. For more information on Organizations and roles, see the Members and Groups section of the Managing your Organization documentation. Select the desired Organization from the list (you can also view your role within the Organization from this list; verify that you are the Organization’s Owner). Important: Make sure you select the correct Organization, especially if you have Owner permissions for multiple Organizations. Failing to do so may result in not receiving payouts. Select Payout Profile from the left navigation bar sub-menu. 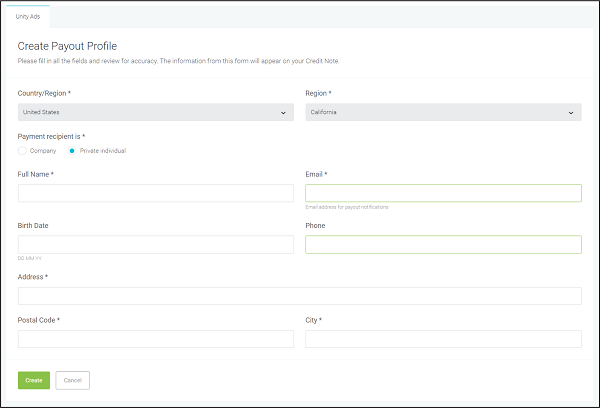 From your Organization’s Payout Profile page, create a new profile by clicking + Add profile. You must enable SMS-based TFA in order to edit payout profiles. If you have yet to enable it for your Organization, the dashboard will prompt you to do so now. If you already set up SMS TFA authentication, skip to the Profile information section below. Enter a valid phone number that can receive SMS messages, then click Next. The specified phone number will receive a 6-digit code via SMS. Enter the code on the dashboard within 60 seconds to initialize TFA. Note: Finnish publishers must register as EU VAT companies. They also must be in the prepayment register (ennakkoperintärekisteri) to receive payments. Click Create to create your profile. Your profile information is now saved. You can edit it any time by clicking the Edit (pencil icon) button. Unity supports Paypal and bank transfers (note that Unity only currently supports local transfers in the US). To add a payout method, navigate to the Payout Method section of the Payout Profile page, then click the Edit or + Add payout method button. Select Hold my payments to withhold payouts until further notice. When you update this field to one of the other two methods, Unity will pay out all accumulated revenue if it meets the specified minimum payout amount. 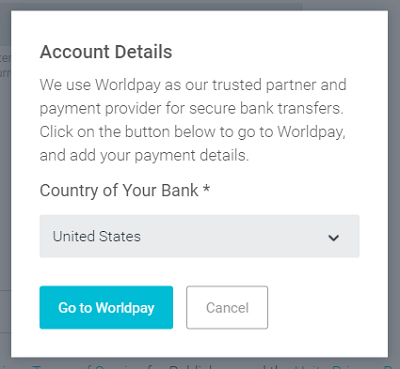 Once you’ve completed the Worldpay form, you will return to the Add Payout Method page. Note: For bank transfers, Unity deducts a transaction fee of 1.5 EUR in the U.S. and 7.5 EUR in all other countries. The intermediate or receiving bank may charge additional fees. If you want receive the payment in any currency other than USD, there will be conversion fees. Note: For every 20,000 USD in revenue paid out through Paypal, Unity deducts a transaction fee of 2% (up to 14 USD in the E.U., and 90 USD outside of the E.U.). When you’ve finished specifying your payment method and minimum amount, click the Create button to save your selections. Unity must collect your relevant tax information in order to withhold taxes when applicable, as required by tax authorities. To validate your tax information, navigate to the Payout Tax info section of the Payout Profile page, then click the Create button. When finished, click Exit interview to return to the Payout Profile page. The Payout Tax info section takes a few minutes to update. When it does, the Tax status changes to Validated. Unity can process payment to you as an individual, rather than as a company. To register as a private individual, simply enter your legal name in lieu of a company name. Please be sure that this name also matches an owner of your Unity organization. In general, no taxes are deducted from payments to companies or similar entities. However, if you are a private individual, payments are governed by tax agreements between your country and Finland. These agreements exist to reduce any possible double taxation and set guidelines for personal taxation rules. Taxes for Ads income are usually between 0-15%, but may be higher for certain countries. Consult your own tax office for further guidance. The European Union (EU) requires members to have a VAT number. The local legislation in each country specifies when you need to apply for a VAT number. If you do not have one, state ”No VAT” or “None” in the corresponding invoice field. Select the date range you wish to query, then click the Apply button to view a list of invoices. Note: Any changes might not affect payouts for the current month. If you need the changes to take effect immediately, or have general issues signing up for automated payouts, please contact Unity Ads support.